I've walked down a lot of them, let me tell you. The Weinstraße/Route du Vin/Wine Road in Alsace is my favorite; but I've also done the Mosel, spent a day in New Zealand's Marlborough region and a week in the Aconcagua Valley in Chile, floated past the vineyards of the Douro river in Portugal, driven through the vineyards of Niagara and New York's largest wine-growing region The Finger Lakes--and of course Napa, Somoma and St. Helena in California as well as all those yawn-inducing wine-growing regions in Italy. For years, I've been planning to do one of those list posts--you know, Top Ten Places to Eat Squid in Liguria, The Twenty-five Most Beautiful Deserted Beach Huts in Greece, One Hundred Lists to End All Blog Lists--but I haven't had a chance. Or the energy. I'll get to it; I promise. But for now, I want to take you to a wine-growing region you probably haven't heard of. Have you ever heard of Styria? Huh? Or the Steiermark in German? No? Let's start with someplace easier. Have you ever heard of Österreich? Huh? Or maybe Austria in English? Ah, now we're on the same page of the map. The Steiermark--I call this place by its German name because until just five minutes ago when I Wiki-ed it, I didn't even know it had an English name--is a fairly large wine-growing region in the southeast of Austria. The capital of the Steiermark is Graz, which has recently become famous for being the home of Conchita Wurst, the winner of the 2014 Eurovision Song Contest. The city was "The Cultural Capital of Europe" in 2003 and it's also known for sort of being the hometown of Arnold Schwarzenegger though he's actually from a little town 4 kilometers from Graz called Thal. If you're a Schwarzenegger fan, you'll be happy to know there's a Schwarzenegger museum in Thal and a walking route dedicated to Ahhnold. 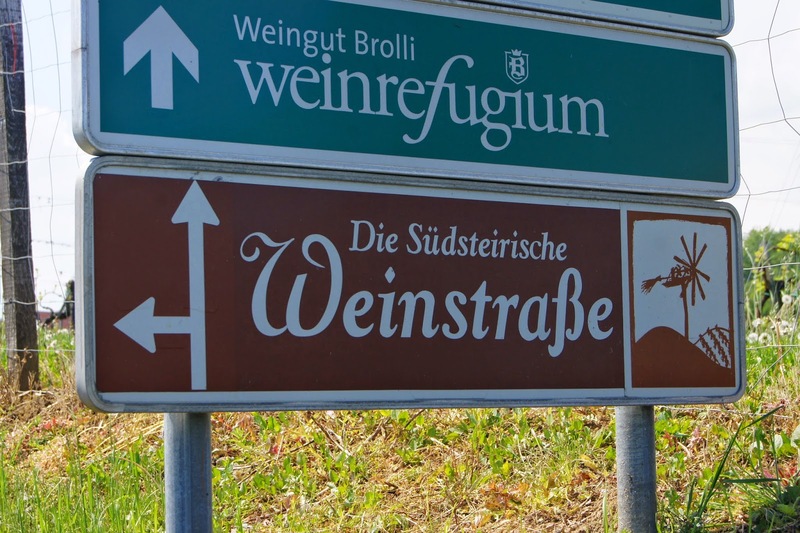 The picture to the left is of a winetasting in the little town of Leibnitz. The Sauvignon blanc was Slovenian and didn't taste anything like a Sauvignon blanc. As we were walking away, a man who'd just tasted the wine was telling the winemaker this. Ouch. 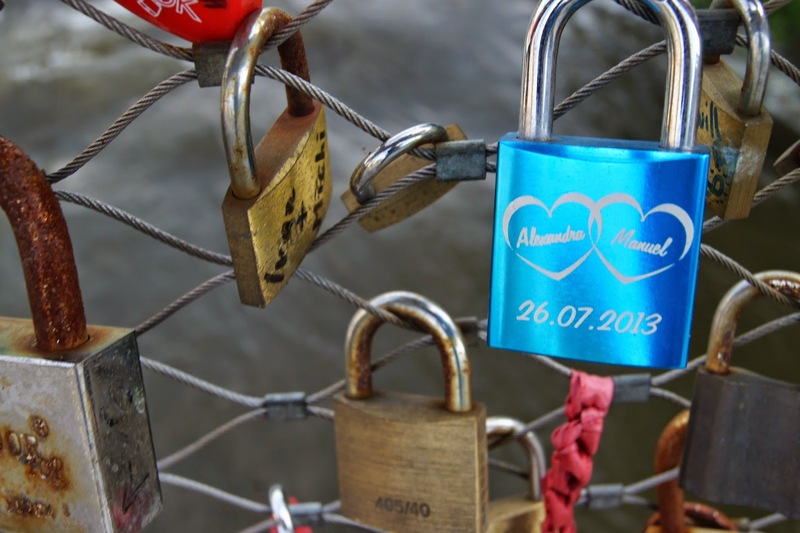 The obligatory bridge with locks. Romantic. Counter protest graffiti against all the racist graffiti here. And there is a lot of it. 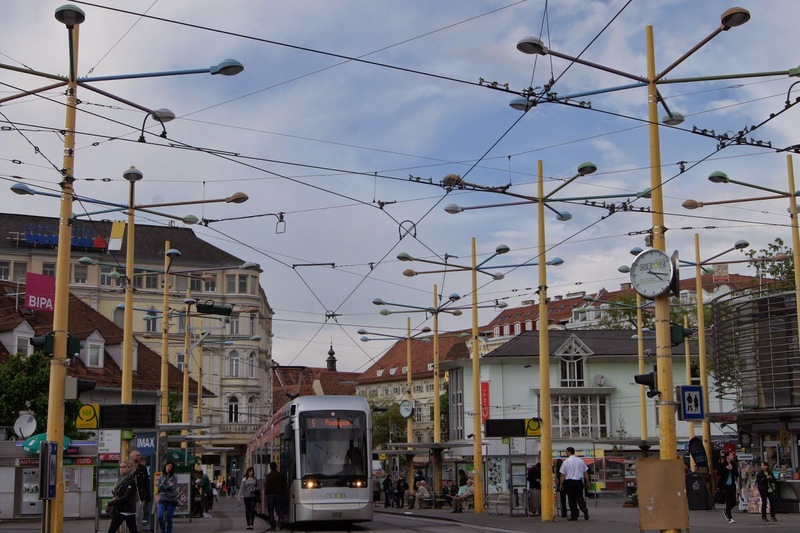 The center of Graz is dominated by the electrical cables for the trams. 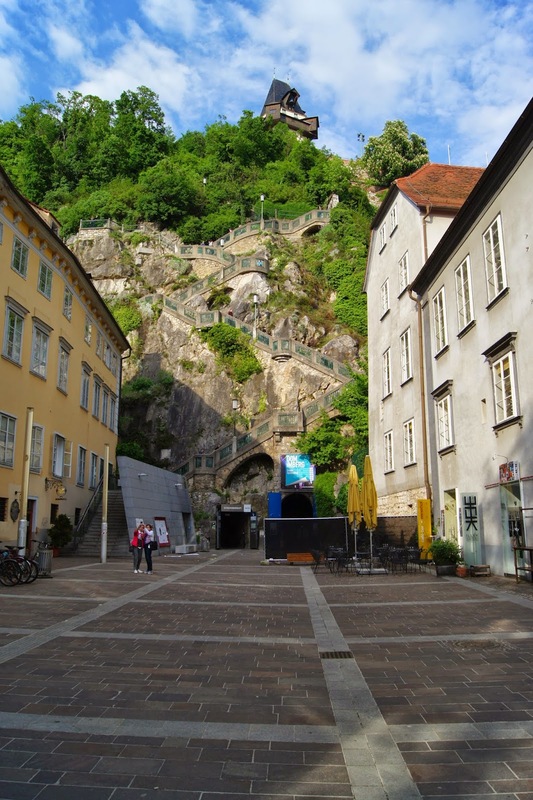 A walk up to the Schlossberg is a Must in Graz. On to the wine road. The best part of the Steiermark is the Südsteiermark or South Styria. This is where you'll have the most picturesque drive and the most interesting bit of the wine route. We started as always in Gamlitz and more specifically at Schloss Gamlitz. On a pretty day, you'll want to spend all day here in this little courtyard. The locals do. One day we spent quite a long time enjoying a private winetasting with the most enjoyable woman, who most enjoyably brought out bottle after bottle after bottle of enjoyable white wines. To taste. We didn't pay for anything. Did I say we enjoyed this? OK, we did buy a case of Sauvignon Blanc barrique for around 20 euros a bottle. The woman knew what she was doing. If you're in your car, though, you'll need to be careful about how much wine you "taste". Have you ever heard of a Buschenschank? A Buschenschank is a place owned by a farmer or a wine-grower who has special permission to sell his own wares on his property. 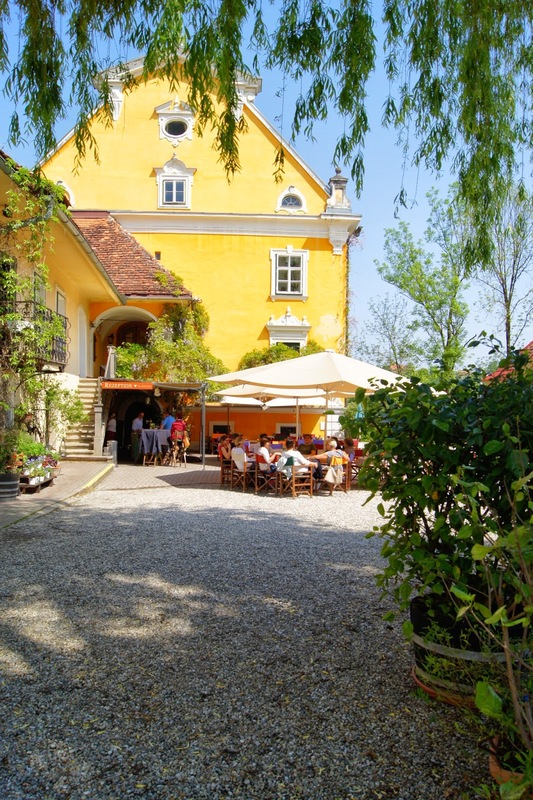 These establishments have grown over the last couple of centuries into full-fledged restaurants, but their main business here in the Steiermark is wine. And you can try the wines at no charge if you want. Just walk up to the bar and ask to try one. A tip: the Morillon wine is Chardonnay. Like Syrah and Shiraz. Like Sauvignon blanc and Blanc Fumé. Like Sangiovese and Brunello. Like Retsina and Battery Acid. That sort of thing. The woman behind the bar at the Buschenschank will tell you that Morillon is Chardonnay, but you should tell her you already know because you read it at I Must Be Off! You'll get a discount, and she'll notice how 84% prettier you are. 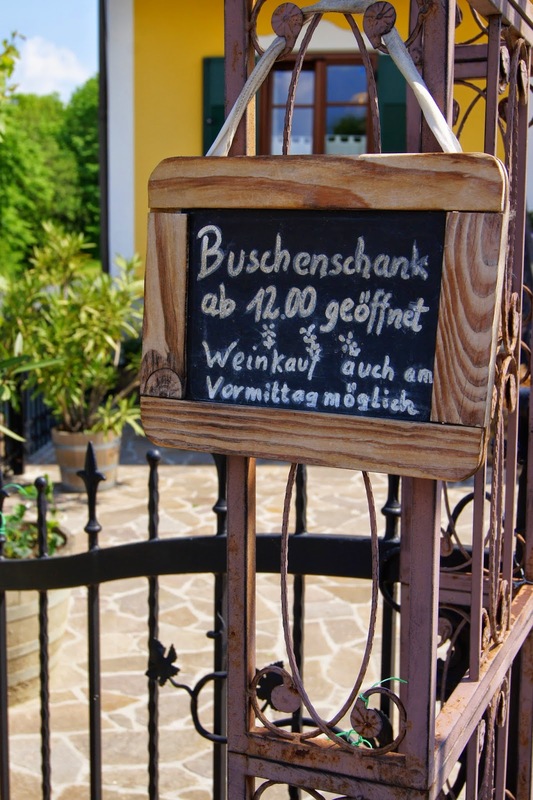 As you drive along the Weinstraße, you should stop occasionally at the Buschenschänke. If you choose to do this route on a bike, you should know that it's very hilly here. There will be a lot of ups and downs.To be honest, there are prettier wine-growing regions in the world. The hills here are lazy rather than dramatic. I almost forgot! This region is famous not only for wine; it's also quite well-known for pumpkin seed oil or Kernöl as the Austrians call it. If you have never tasted pumpkin seed oil, the most incredible place to do it is with Elke Muster at Schlossberg 60 in Leutschach, Austria. What a beautiful person. Pumpkin seed oil--with its dark green color and nutty buttery flavor--must be the secret to happiness. We also tried some homemade schnapps made from pumpkin seeds. Map to Elke Muster's Krennmühle. 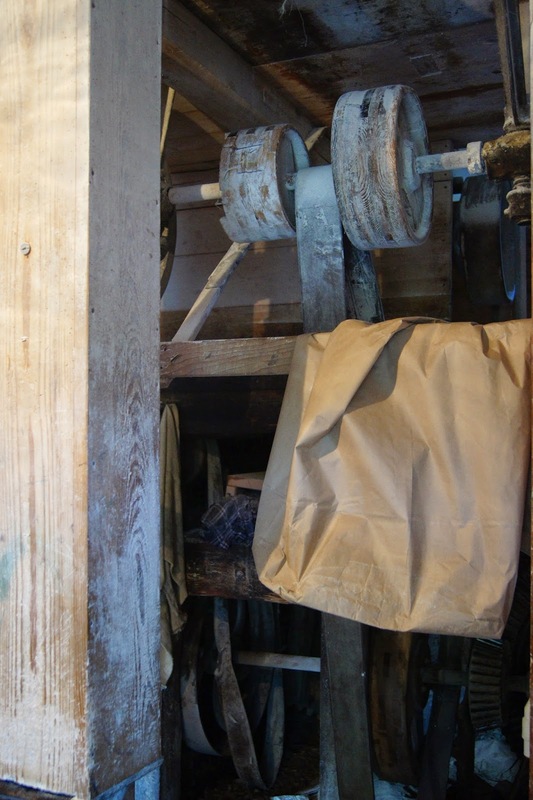 Elke Muster is actually more famous for the Krennmühle which has been in her family for six generations and still mills grain for the bakeries in the area. It's been in operation for more than 200 years. Also interesting for those of you who want to walk in the area of Schlossberg, here's an excellent walking map. What wine roads have you visited? I'd love to hear about those off the beaten path. Have you entered the I Must Be Off! Travel Essay Contest? Deadline June 30, 2014! No entry fee! 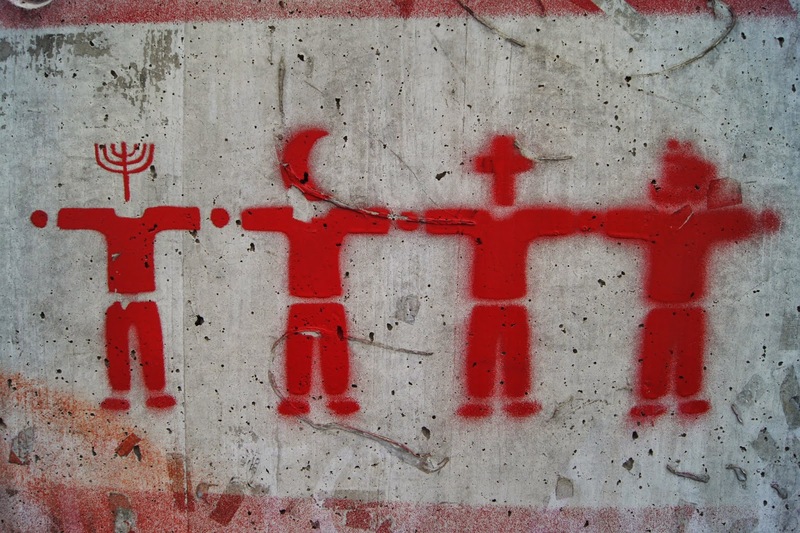 Click HERE for the guidelines. 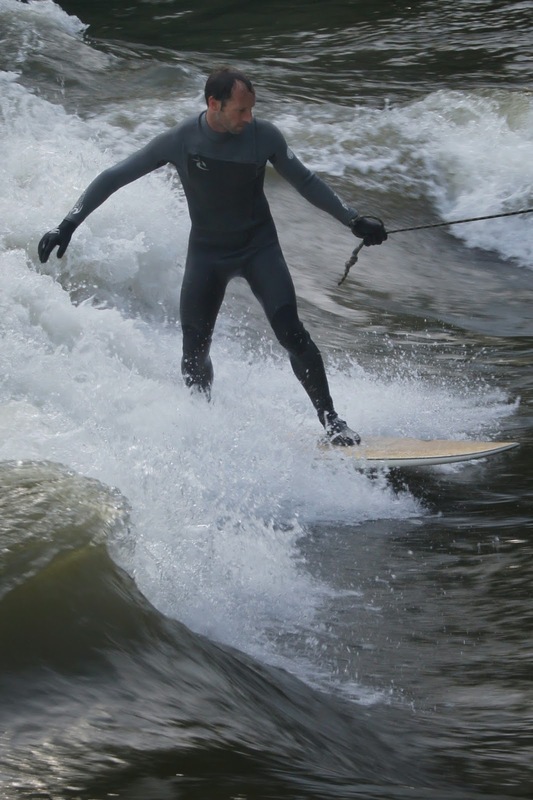 This looks so fun. 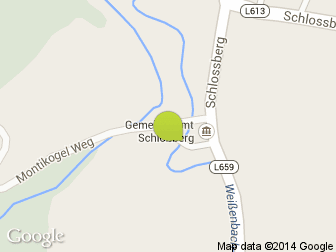 I loved what I saw of Austria, but that was many years ago, and of course, I love exploring new wine regions. Hi, Jenna! 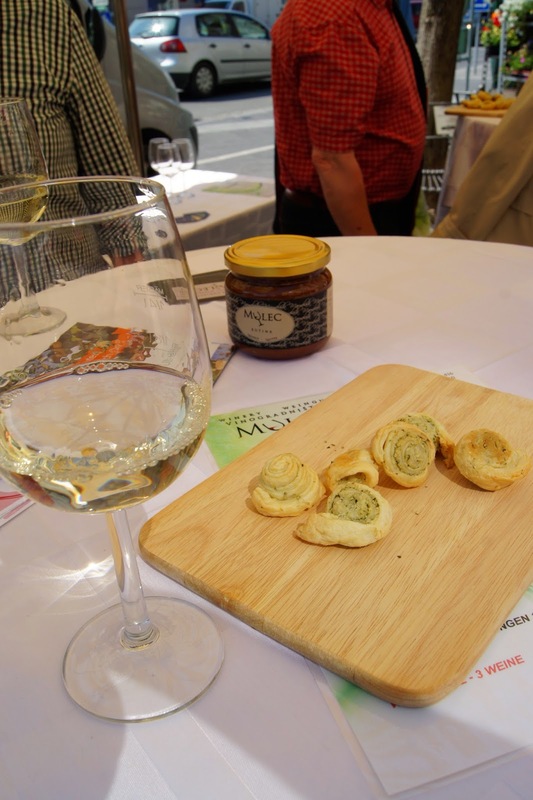 The Steiermark is great for wine and food. If you really love white wines, Alsace is always worth a few trips. We go at least a couple of times a year.